• Robust and amenable to HTS: detection at 620nm greatly reduces potential interference by colored compounds. Z’ factors of >0.7 are observed in 96-well and 384-well plates. Can be readily automated on HTS liquid handling systems. 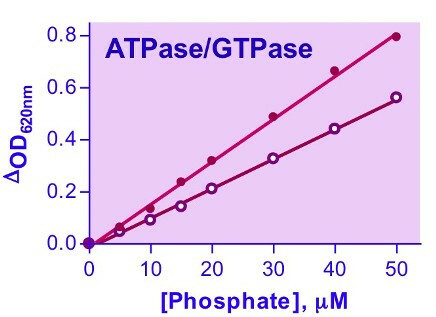 ATPases and GTPases catalyze the decomposition of ATP or GTP into ADP or GDP and free phosphate ion. These enzymes play key roles in transport, signal transduction, protein biosynthesis and cell differentiation. 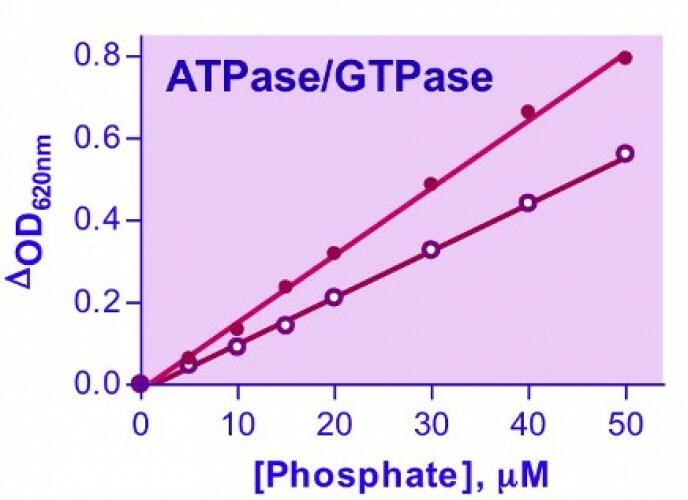 BioAssay Systems’ QuantiChrom™ ATPase/GTPase Assay Kit offers a highly sensitive method for determining ATPase/GTPase activities in a microplate format. Its proprietary formulation features a single reagent for accurate determination of enzyme activity in 30 min at room temperature. The improved malachite green reagent forms a stable dark green color with liberated phosphate, which is measured on a plate reader (600 - 660 nm). Applications For quantitative determination of ATPase, GTPase or any enzyme activity that liberated free phosphate and high-throughput screen for their inhibitors. References Assay: ATPase/GTPase in Bacteria ATPase (B. burgdorferi) (Pubmed).